← FREEDOM OF SPEECH, SCUMBAGS OR FREE EBOOK PROMOTIONS? “Never give another writer your book to review. If I like it, I’ll hate you for it and if I hate it, I’ll hate you too.” Or something of the kind, in the competitive reality of life and art. 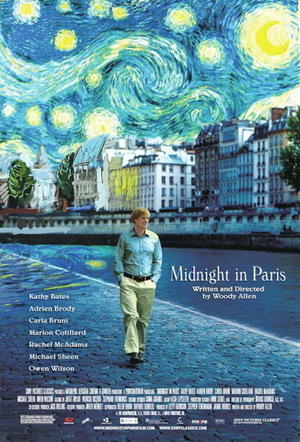 So Hemmingway tells Gil Pender in Woody Allen’s totally delightful Midnight In Paris, as a modern American author steps into a midnight chiming fairy tale of nostalgia for that seminal artistic world, Paris in the 1920’s. As the chimes strike in the most beautiful and feminine of cities, Pender is whisked away from his monied, Republican nightmare parents-in-law and his ignorant, materialistic fiancée, to mingle with the likes of Scott and Zelda Fitzgerald, Hemingway, Cole Porter, Picasso, Dali and Gertrude Stein and fall in love too. You have to know a little about the people to catch the wit of all the cameos, Hemmingway’s spare life prose, that once admired brave little boats, Adrian Brodey’s remarkably real “I am Dali!” or Martin Sheen’s brilliantly revolting cultural know-it-all. The charm is everywhere though. Owen Wilson as Pender is of course a more handsome Woody Allen himself, who always sparkles by following his artistic passions and enthusiasms and turning them to story. It has a very simple philosophy, as everyone worth falling in love with, past or present, has their own nostalgic ‘golden age’ longings and Pender finds his meaning and freedom by refusing to tow other’s lines and facing up to the now. So he finds the girl who just likes strolling in the rain. Since we’re here and right now I rather dislike readers, writers and artists too, until I find the charm again, a book will never even be reviewed if Dragon In The Post doesn’t RECEIVE YOUR BACKING HERE Thank you, and if it doesn’t make it we’ll always have Paris in the rain. Sounds like a really interesting film!